Should you wish to make an appointment to discuss a project or prepare a plan please call 01357 238491 to avoid disappointment. Free home design visits available with no obligation. Discount Kitchens and Bathrooms Ltd is a family business with over 30 years combined experience in the fitted kitchens, fitted bathroom and fitted bedroom wardrobes industry. 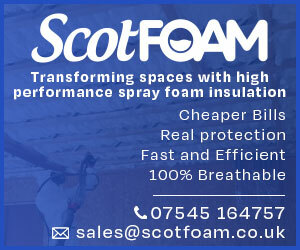 We are based in East Kilbride near Glasgow, have a showroom in Strathaven and an office in Livingston, East Lothian. We offer bespoke / made to measure kitchen units and doors, fully fitted kitchens with top brand kitchen appliances, top quality bathroom suites and fully fitted bathrooms. We offer a full installation service from start to finish using our own certified trades people. We do not advertise and have not advertised in many years as we gain all of our work through word of mouth and repeat custom. As DKB Ltd has no commissioned sales staff and do not advertise our overheads are kept to a minimum, this means the cost to our many customers is kept to a minimum. The MD Steve Crosbie is available for every one of our clients to speak to in the new showroom in Strathaven which has many fine examples of fitted kitchens, bedroom wardrobes and fitted bathrooms and also has several samples to see. The showroom ensures that every client gets the very best fitted kitchens in Glasgow, fitted bedrooms in Glasgow and fitted bathrooms in Glasgow – all designed on CAD and costed properly first time with no hard sell. We will design, supply and fully install all our bespoke kitchens Glasgow. We can also supply and fit uPVC double glazed windows, uPVC doors, composite doors and French doors. Other services include the installation of central heating systems and central heating boilers. We do not pressure sell, all we ask is for the opportunity to visit your home at a time that suits you; we will then measure, plan, design and cost the work you want done; this will be with no obligation. If you wish to take the process further we can prepare CAD drawings and a visit to the showroom to confirm colours and finishes etc, then should you decide we can arrange an installation date and technical survey. In the last few years the furniture factory has invested over £1 million in the latest technology for the manufacturing of bespoke kitchen units, kitchen doors, wardrobes, sliding wardrobes and bathroom cabinets. We have a large selection of modern kitchen designs and traditional kitchens designs to choose from. 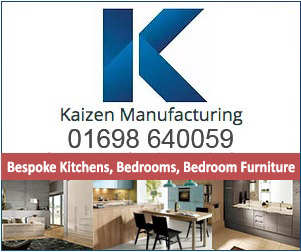 With Discount Kitchens and Bathrooms ltd you can feel assured you are buying your kitchen or bedroom from one of the leading kitchen and bedroom manufactures in the UK. Whatever your taste, budget or bathroom design you want we will help you to create the perfect fully fitted bathroom. With everybody’s busy lifestyles nowadays, a fitted family bathroom should be a sanctuary. If you are looking for a bespoke fitted wardrobe or sliding door wardrobe, our bedroom designer will help you to design your new fitted bedroom. We even have the latest 3D design software available to help you visualize your new bedroom furniture. All our fitted bedroom units and doors are manufactured / tailor made by ourselves so we can install a wardrobe into any room size or shape even if it has sloping, high ceilings or even a loft/attic. Planning and designing new bedroom furniture can be tricky if you have a small room. Sliding wardrobe doors offer you a way maximize your bedroom storage space without taking up too much floor space. We offer other services to our clients to help make a home improvement project steamlined and hassle free. 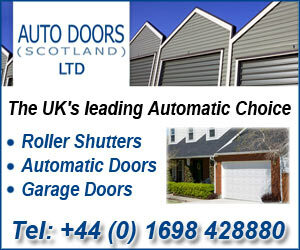 We can supply and install double glazed windows and doors, composite doors, french doors etc, we can also supply and install central heating systems & combi boilers etc and we have many lightning products, accessories and unique furniture to compliment our fitted kitchens, bathrooms, bedrooms and home studies. For the best quality, value and service in East Kilbride, Hamilton, Motherwell, Coatbridge, Airdrie, Strathaven, Kilmarnock, Lanarkshire, Livingston, Lothian and Glasgow call DKB today. Happy from the start to the finish- would recommend them to anyone- their workforce was excellent. Very impressed with initial contact and with the finished result. The fitters worked hard and were clean and tidy. Very happy with the bathroom and would recommend. Any issues were resolved quickly and with no fuss. Overall the finish was very good. Absolutely delighted with my new bathroom. 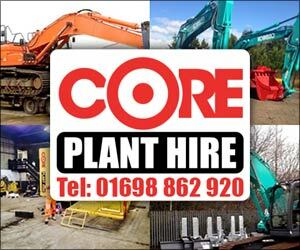 Don't hesitate in using this company for any work required. Fitters done a first class job, very happy with the end product. My mum is delighted with her new bathroom. Steve’s design optimised the storage in a small space. Communication was great throughout and she appreciated the courtesy visit by Steve after the job had been completed to check she was happy with the work. High quality workmanship and the old fixtures were disposed of leaving no mess behind. Worth paying a bit extra for the quality finish. The attention to detail by the fitters was excellent. Excellent service, punctual and reliable workers. Everything was tidied up at the end. Love my kitchen- great job from start to finish- the fitters were brilliant, nothing was a bother. Thank Steve for a great job. Innovative design ideas made them stand out. Price is similar to competitors but the service is better. Overall very happy. Good quality installation. Excellent results- a transformation of the bathroom. Steve came back with a design that worked better than others and his fitters were outstanding. I was never happy with our bathroom but I am now. Really happy with product and tradesmen. Excellent service from first meeting. 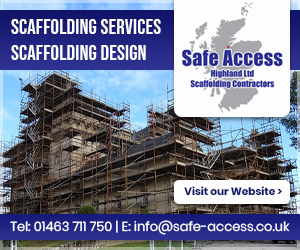 Professional approach and tidy site workers. Happy with bathroom and work carried out. Thoroughly professional job from start to finish. 1st class standards from all. Tradesmen were polite, friendly and professional at all times. I would recommend them. We are delighted with our new bathroom. I would recommend DKB to anyone who needs a new bathroom. No complaints, will be back for my new kitchen after Christmas. Excellent service. Tidied up, no mess. First class. Love it. Quality of product is excellent and the workmen were reliable and efficient. We have just had our ensuite upgraded by DKB Glasgow and are extremely happy with everything they have done! Steve came out to the house to give us a quote and we also visited the brand new show room to see the range of products available. We decided to set a date for the work to be completed whilst we were away on holiday and Richard and his team worked long days to ensure everything was done in 3 days. When we returned, everything was immaculate, from the tiling to the finishing touches and we were both delighted. We have already recommended them to friends and work colleagues and our neighbours were so impressed with everything they are considering using them for their own bathroom in the near future. Steve also gave us ideas for our kitchen so can’t wait to book them in to get that done too! All tradesmen on this job were punctual, clean and did an excellent job. I would recommend them. The team from start to finish was fantastic highly Recommend! I was consulted in every aspect of this work and I would recommend this company to anyone. Excellent customer service and really helpful from start to finish. Would highly recommend and use again. Very good, kitchen fitters were excellent, would recommend them to anybody and would use the firm again. Superb job from start to finish. We hadn't two new bathrooms installed and are delighted with the results. Thanks for everything. Many positive reviews steered me towards Discount Kitchen & Bathrooms Ltd Glasgow. The initial meeting/design visit with Steve (owner) confirmed this was the company for me - to completely overhaul and fit my new kitchen. The work started on time and it was a pleasure to have the tradesmen in my flat, very tidy and highly professional throughout. The finished kitchen is quite something and exactly what I wished for, superb quality. 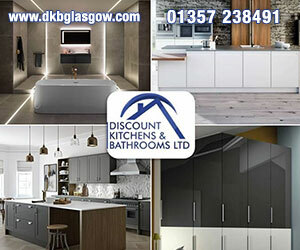 In future DKB Glasgow will be my choice for all upgrades and already I've made recommendations to my friends looking to upgrade their homes. Without question this is the company for you. We found all staff from sales through to fitters, very helpful, friendly and professional. Any issues we had here been dealt with promptly. We would recommend company to friends and family based on our experience. Great products, service and work from start to finish. Glad I found you. I'm pleased with my new bathroom. Tradesmen were very good at their job and they were very clean and tidy. Special mention for Allan we were pleased with his work. I would recommend the company to all my friends. Very happy with everything I was worried about getting the right company. They have made me very happy , everybody who has come to my house has done a great job, cleaned up and really cares about my job. Steve has a great team. I am so very happy with my new kitchen. I really didn't know what I wanted. Steve showed me his ideas and it all just clicked. Also a special thanks to the guys who installed it. Pure dead brilliant! Excellent service from start to finish. Very professional and efficient. Complete transformation, wall down, walls plastered, kitchen/dining room/utility room floored, kitchen fitted, floor, ceiling, spots and under-lights on plinth. What can I say? Kevin (joiner) you were amazing. Your went above and beyond the call of duty. Thank You. Excellent company to deal with no hard sell and Steve was great to deal with throwing ideas in our direction but also listening to us and our requirements. Would recommend to any potential customers. We've just had our Bathroom renovated with Steve's team at DKB. Everything was first class, from the start with Steve visiting going through the options, to the team who completed the full bathroom in less than 3 days. The bathroom/house was handed over to us very clean and tidy, you hardly would have known they had been in. Highly recommended. We will be contacting Steve, with no hesitation, for future work and have also recommended to family. Thankyou and Well Done DKB! Over the last 2 years DKB has helped us modernise our home with a new kitchen, bathroom, en-suite, cloak, bedroom wardrobes and flooring throughout - they even made us a bespoke kids bed for our daughters room. The reasons for using DKB are simple, a professional design service, hundreds of options to get the look you want, high quality materials and workmanship, and highly competitive prices which remove the hassle of taking the DIY option. I would not hesitate to recommend DKB to anyone wishing to make home improvements. Superb service guys work real hard to get the kitchen finished, still some work to be done but service great, kitchen quality units installed. Will recomend to anyone to use them for their kitchen remodel. "Just had our bathroom completely renovated, bath taken out and a lovely big walk in shower installed. The bathroom fitter was Kevin and we can't praise his work enough brilliant job the plumber and electrician were very good too great job all round wouldn't hesitate to recommend this company Bill and Ann Robertson"
"I have a top quality bathroom and my installation team were very conscientious. I would highly recommend Steve and his team." "Absolutely delighted, very professional design, service and first class fitting team. The fitter worked late and worked extremely hard and I am very happy with my new bathroom." Just had our kitchen totally re-fitted by Gerry and the gang and what a fab job they made! All the work was done super quick without cutting any corners. You guys are amazing as is our kitchen - love it! "I am really happy with my new bathroom and found the company to be professional and helpful throughout the work." "Fantastic fitters - 6 stars!" "Excellent contact throughout & quality of work is outstanding. Great help from sales staff before the purchase and all workmen throughout. House left tidy every night. Delighted with work." "Fantastic job. Excellent finish. Gordon went the extra mile to do a great job. Thanks so much." "Delighted with my new bathroom. Brian and John were really helpful and clearly committed to producing a high quality finish that suited our needs. I can't thank you enough for overcoming the many challenges that my bathroom threw at you. Welcome back any time." "We are delighted with our new bathroom from DKB. Kevin (Installation Manager), Jim (Tiler) and Stuart (Plumber) were all so friendly and worked non-stop to get the bathroom finished quickly. The finish, as promised, is to a very high standard. We would recommend DKB to our friends and family without hesitation, and hope to use them again for further home improvements." "From design to completion the company looked after my job and gave me the dream kitchen I wanted. Can wait to get my bathroom next"
Great service and communication received throughout our kitchen installation. Excellent planning service as we had someone out to design it at no cost. Would be happy to use again. "Punctual, and polite,, the usual friendly banter, when asked anything about their work it was explained well, no faults what so ever, they even cleaned and hoovered after them,,, excellent standard and would recommend them and the company to anybody." A family run business with a friendly and personal approach. All quality products and workmanship. Steve and his team were great from start to finish, the quality of the work was excellent, quick and clean. I would recommend this company to everyone. "We had a custom fitted bathroom installed by DKB. The standard of work by Brian and John was excellent and they kept us informed what was required during the fitting. The bathroom furniture manufactured and supplied by DKB is first class. Great service from all staff. Highly recommended. Professional workers, clean and tidy throughout. Nothing was a problem, highly recommend. DKB have recently refurbished my house to an amazing standard! Kitchen stripped out and insulated, new central heating system, kitchen refit, new bathroom and wardrobe doors. A challenging job in a Victorian conversion and the result is one of absolute quality at an amazing price and done within the proposed timescale despite the usual hitches uncovered in this type of property. Thanks to Steven, Gerry and the team .... I'm delighted with the result! "Very impressed with Douglas who came out and helped us decide on how to sort the bathroom out. Excellent service from the rest of your guys. We are both delighted. Thanks." "Beautiful bathroom. Absolutely delighted from start to finish. Workforce were a delight to have in our house. From consultation, survey and work done was just great"
Ours were fitted professionally with no mess left behind. I can't recommend these guys enough, start to finish Davie, Kenny and Rab were fantastic, nothing was a problem and now I have a beautiful bathroom with a shower I never want to leave! If you're thinking of having a bathroom refit, this is the company to choose! "Excellent job done on 2 bathrooms. Jim paid great attention to details. Very happy with end result." "We were most pleased with the job, DKB's team of excellent tradesmen worked hard and tidy. Nothing was any bother and we now have a wonderful new bathroom." "Steve gave us excellent service and advice. Great quality and workmanship. Highly recommend." "We had the kitchen done 2 years ago so when we needed the bathroom done it was a 'no brainer'. Back to DKB. The guys were brilliant and very professional. Steve was very helpful without being pushy. I would recommend them to anyone needing work carried out." "High quality kit at a very reasonable price. Problems sorted quickly and reasonably. A good service all round." "Very professional, friendly service. Highly recommended." "All tradesmen were very efficient, friendly and professional. Steve is there to ensure that standards are in place and things go smoothly." "This is the second time I have used this company, excellent service and pleased. I now have a brilliant toilet and kitchen both out of this world. Brilliant company." "Top marks to Steve and his team they were fab! Happy to work out any issues that came up and great quality of workmanship throughout. Would definitely recommend." "Absolutely delighted with the bathroom and how quick it took, only took 3 days to finish. Well worth it." "This was not a particularly straightforward bathroom refurbishment project but I found their help and advice in planning what could work very helpful. They provided a very broad range of services and products, which also included some lovely one-off and limited edition products. I was able to secure a fantastic looking bathroom, although there were a few hiccups during the job that had to be corrected. What impressed me was that Steve made sure that everything was sorted out very quickly and he kept in close contact during the whole job. I was so pleased with their work that some months later I asked them to upgrade elements of my kitchen. Again, I was very pleased with their work ethic and the end result was superb. Their price was also very competitive and were able to do the work in a timescale that worked best for me." "A fantastic service straight form the initial visit. De-lighted with the final article. A cracking Kitchen. All tradesmen a pleasure to have in my home." "Professional service throughout from the beginning stages right to the end. We are over the moon with our new family kitchen and bathroom it had transformed our home and was stress free." "Very professional and helpful in explaining best design for the shape of the bathroom. Would not hesitate to recommend this company and their staff." "We had our kitchen fitted by DKB six years ago and it still looks like new. We have now had our bathroom done and we are absolutely delighted, it was a complete transformation, the workmen were all very professional, friendly and kept us up to date with progress. Steve oversaw the whole project from start to finish and helped us with our decision making, he also added upgraded extras at no extra cost. We would definitely recommend them and would not hesitate to use again." "Great service, great team, great job! Could not have asked for better. Would recommend company to anyone." "From start to finish DKB was professional and good to work with. Nothing was a problem and even extra work carried out was no concern and completed well and without fuss. Any snagging work was dealt with quickly and rectified to our satisfaction. No hesitation in recommending to anyone. " "Most professional service, the DKB team started right on time, very courteous. 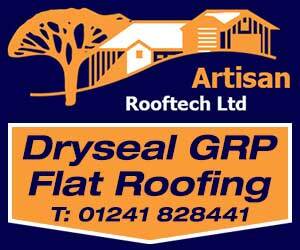 Excellent workmanship, would recommend." Excellent company to deal with. Steve came out to look at refitting my bathroom. There was no hard sell and spent time finding out what I was looking for and going through samples. He came up with a few suggestions I had not thought about also. Richard who fits the bathrooms then came out a few days later to measure the bathroom and was also very pleasant. I have no doubt that i will use this company again and will recommend it to anyone looking to get work done on their house. "Excellent service from start to finish. Amazed at how quickly the work was carried out. Everyone involved was helpful. Could not be happier with my new bathroom and bedroom. I have already recommended Steve to the friends and colleagues. Will be in touch again to have our kitchen doing. Thank you so much." "Very professional, friendly and efficient. Standard of work excellent. Would definitely recommend and use again. Job well done." "1st class, would not hesitate in recommending them, also came up with design that I had not thought of." "I am delighted with my recently finished new kitchen, completed by Stevie Crosbie and his team at Discount Kitchens & Bathrooms Ltd. Upon completion I had a number of snagging issues, but each and every one of them was dealt with efficiently and professionally without need for any disagreements and to my complete satisfaction. As a result, I would without hesitation, recommend Discount Kitchens & Bathrooms Ltd to anyone looking to have a professional job completed. I wish you continued success in the future." "First class service, great value for money. All old materials removed promptly. " "The workmanship from start to finish was excellent. Kitchen is fabulous. Tradesman were excellent, would recommend to all my friends and family." "We were provided with an excellent service, very professional. The attention to detail and finishing was fantastic, we got all this at a great price. Thanks Stevie and crew." "We are extremely pleased with our newly installed kitchen. 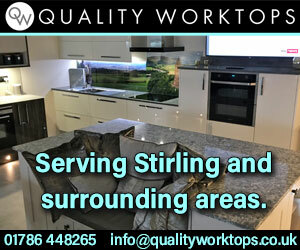 Excellent quality cabinets, work tops and fittings. Excellent workmanship from start to finish. 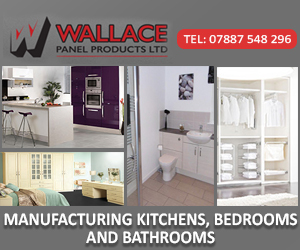 I would thoroughly recommend this company if you were after a new kitchen." "Team very polite and friendly again. Excellent work done. Will be using them again. Would recommend them to all." "Excellent professional service. All work completed to a very high standard. Fast, effective service. Would definitely recommend. Thank you." "Workmen were first class and no mess left after days work. First class job can recommend them. Just ring Steve." "I would 100% recommend, they did a wonderful job for us." "I would definitely recommend. They were very helpful and gave us some very good advice. They provide a full design service which we really liked." "I would definitely recommend as I was delighted with the whole experience from start to finish. They very professional and pleasant." 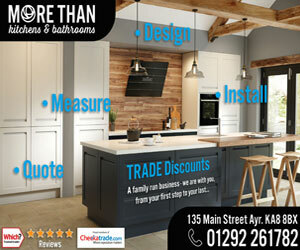 Discount Kitchens and Bathrooms Ltd. 5 out of 5 based on 125 ratings. German handless design in Lanarkshire. Concrete effect island and breakfast bar, acrylic ultra gloss tall units, top spec AEG appliances and quartz worktops. traditional kitchen with range cooker, mantle and granite worktops by DKB.